Occasional Brief Observations: Non-sequiturs, etc. I. Apparently a new subject for litigation is the 'follow' and 'block' functionality of various social media vehicles such as Twitter, Facebook, etc., see: Trump’s Not the Only One Blocking Constituents on Twitter. Apparently a number of people are annoyed at various politicians have 'blocked' them after they "voiced dissent." They are claiming that "losing this form of access to public officials violates constituents’ First Amendment rights to free speech and to petition the government for a redress of grievances." In fact, they supposedly claim that "it’s akin to being thrown out of a town hall meeting for holding up a protest sign." Apparently some folks not only want to vent their frustration on Twitter/Facebook, they also expect the person they are venting at to be obliged to see/read their tweets/posts (at least if they are an elected representative). That seems to be quite a stretch! II. Next up is this article: 'Trump Administration Returns Copies of Report on C.I.A. Torture to Congress.' It would have you believe that the Trump administration is working to deep-six Congress' "torture report" by conspiring with the Republican chairman of the Senate Intelligence Committee. Apparently, "The Senate Intelligence Committee, which was run by Democrats when the executive summary was released, sent copies of the entire report to at least eight federal agencies, asking that they incorporate it into their records — a move that would have made the documents subject to requests under the Freedom of Information Act. That law, which allows citizens, the news media and other groups to request access to information held by the federal government, does not apply to congressional records..."
Contrast the scummy Republicans (working to let the report "remain hidden") with the virtuous Democrats (working to make sure that the report becomes available to the general public). One small problem with this characterization... the President referred to in the first paragraph, the one fighting a "pitched battle over how the history is told" is President Obama, and he was on the side of keeping the report a secret. Had he been on the side of disclosure, the report could have been declassified and released! Something you would never understand from this article, which, while recounting factual details, at the very least has glossed over a significant part of the truth! "President Trump would have “maybe 10 minutes” to decide whether to launch a retaliatory strike against North Korea — should it ever fire a missile that’s capable of reaching the US mainland, experts say. So, according to this expert the President has "maybe ten minutes to decide whether to launch a retaliatory strike" on being informed of a North Korean ballistic missile launch (once they have a credible, working missile that is)! What a load of codswallop! Say North Korea launches a nuclear-tipped ICBM, say even a half dozen... why exactly does the President have only 10 minutes to make a decision? He could wait an hour, a day., a week, a month... and then order a retaliatory strike. Now if it was a case of hundreds of ICBMs coming from Russia, then there may be a very short timetable, because it could be case of "use them or lose them!" Even in such a scenario, given the nuclear triad with resources around the globe, it is highly likely that the U.S. could absorb an attack.. and still maintain a second-strike capability, even if you buy the 'end-of-life-as-we know-it EMP' scenarios! The bottom line? The 'only ten minutes to respond to a North Korean nuclear missile' meme is risible, and the so-called 'expert' should be ashamed of peddling such nonsense! IV. 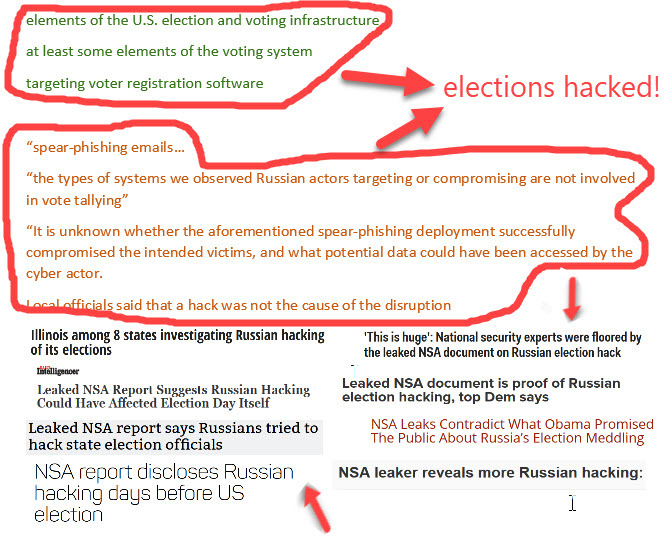 On to the latest leaked NSA document on Russian "hacking" of the U.S. presidential "election" as detailed by an article published by The Intercept. One problem with this article was its use of multiple, different characterizations of exactly what the scope of the attack consisted of. 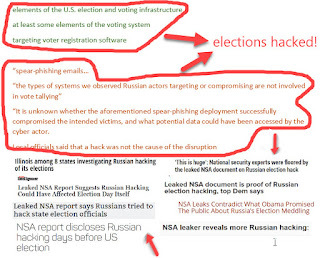 In the article this was variously characterized as a "cyber effort against elements of the U.S. election and voting infrastructure" and "...Russian hacking may have breached at least some elements of the voting system..." and also "...targeting voter registration software..." among others. Another problem is the article simultaneously included a number of (mild) reassurances from the leaked document (e.g. "unknown whether the aforementioned spear-phishing deployment successfully compromised all the intended victims, and what potential data from the victim could have been exfiltrated") with various speculations from "experts" about worst-case scenarios. However, at least The Intercept covered it all, clearly doing a better job than much of the other reporting which lost all nuance and turned it into "The Russians hacked the elections"